For nearly two decades, Aeroseal Windows & Storefront has served as a one-stop source for commercial windows for companies in the Mid-Atlantic. We are a vendor-installer, and we provide comprehensive project management support. Our team manages window and door sales, design, and installation. Contact us today for a FREE estimate and consultation for commercial windows and doors in Scranton, PA.
Aeroseal has streamlined the commercial window installation workflow. First, we will speak with you about your needs and the job site. Then, we develop a tailored design and source materials from our 50+ manufacturing partners. All of our installation team members are master certified installers, ensuring quality, built-to-last window fittings. At each installation, you can expect a dedicated, on-site project manager at your service to provide progress reports and for quality assurance. If you have any questions, feel free to ask the PM or give us a call. The façade of your property is your company’s calling card. If you’re looking to enhance the front of your property, Aeroseal is your partner. We provide custom storefront construction and commercial door installation, and help businesses develop unique, storefront designs that create lasting first impressions. We have experience designing and building all types of storefronts, including elegant all-glass façades and 100% custom steel designs. We also manage sales, design, and installation for interior and exterior commercial doors. We have the sales connections to provide the best prices on interior/exterior commercial doors, and we provide access to a range of innovative products. 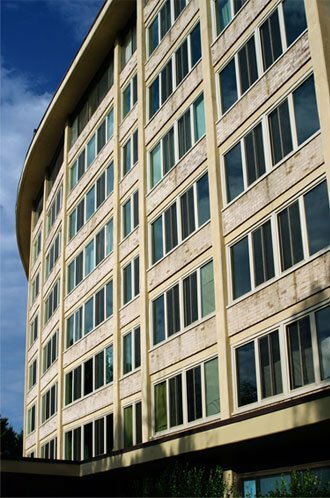 Whether you need commercial windows and doors for aesthetics or efficiency, Aeroseal has you covered.